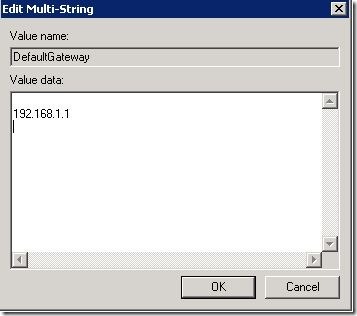 If you run ipconfig on the SBS 2008 server you will notice that the default gateway is blank. If you manually assign the default gateway the connectivity will be restored until you reboot the server. After you reboot the server, the default gateway may again be lost. In certain conditions, the netsh command improperly adds a Unicode Null character before the real value for the default gateway in the registry. Note: The Small Business Server Connect to the Internet Wizard uses the netsh command to set the default gateway on the server. Use the following steps to resolve this problem. 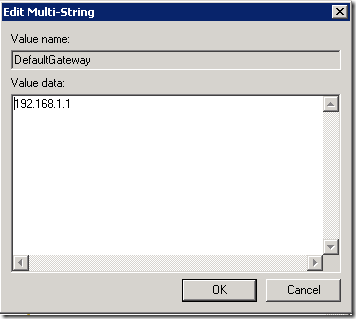 Go into the TCP/IP properties of the network card and enter in the proper default gateway. Download and install the hotfix associated with article 973243. This fix will prevent the netsh command from adding the Null value in the future. Manually edit the affected registry key to remove the improper value set by the netsh command. Where is the interface value for the network card. Once the update is installed and the registry change has been made, you must reboot the server.